Getting ready for our NCL cruise to Alaska! My sister, Jennifer, and I are headed off on an Alaskan cruise in a little over a week from today. We are going on the Norwegian Pearl out of Seattle, Washington. 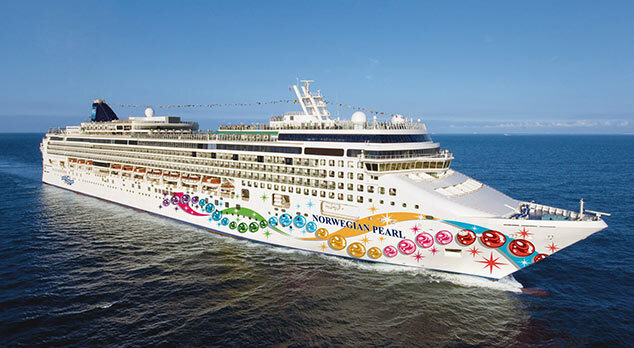 I’m a huge fan of Norwegian and this will be my 6th cruise with NCL. Now, I’ve done this exact cruise once before in September 2011, but this will be Jennifer’s first time in Alaska. Aside from planning what we need to pack etc., we have spent a lot of time planning what to do at each port. Here’s what we have planned! Description: Experience a genuine Alaskan adventure while supporting the official state sport! Take an exhilarating sled ride and play with husky puppies, all in the heart of the lush Alaskan rainforest. Experience a genuine Alaskan adventure while supporting the official state sport! Take an exhilarating sled ride and play with husky puppies, all in the heart of the lush Alaskan rainforest. Upon arrival at this authentic summer training camp for mushers and their sled dogs, you’ll participate in a sled dog summer training run on a custom designed, wheeled summertime sled. Discover the power of a team of Alaskan huskies as they whisk your sled down a mile long trail through the depths of the Tongass National Rainforest! Then join a dog handler and sled dogs for interactive demonstrations on mushing equipment and the impeccable care the dogs receive. Your dog handler will also entertain you with knowledge about the training, history, races and inspiring efforts required by this sport. Admire the untamed beauty as you walk across a suspension bridge overlooking Fish Creek. This camp is surrounded by moss-covered forest with huge spruce and hemlock trees. Then cuddle up with a husky puppy and take your picture with one of these adorable future athletes! This excursion is the perfect mix of Alaska’s culture, history, adventure, rugged wilderness, and of course sled dogs and puppies. Description: Join professional mountain guides for an exciting rock climbing and rappelling adventure on the stunning granite walls of Alaska! Your adventure begins with an interpretive drive through historic Skagway and up into the majestic White Pass Gold Route. A short hike through the temperate rainforest on an interpretive trail will bring you to the base of the spectacular rock face carved by retreating glaciers. Here you’ll gear up with rock climbing shoes, helmet and harness and then you’re off to enjoy this incredible experience. Choose between over a dozen climbing routes, each ending in an amazing view of the Skagway River and the surrounding wilderness. You’ll also have an opportunity to try an awesome 70 foot rappel! This adventure is perfect for those looking to try rock climbing for the first time, as well as for experienced climbers. Description: Experience the infinite beauty of Alaska’s remote glaciers! A short drive brings you to the heliport where, following a safety video, you’ll be outfitted with boots and vests. Lift off from the historic Skagway waterfront and head into a rugged region of sheer mountains, majestic valleys and massive glaciers. Jagged peaks towering over the Chilkat Glacier, cascading waterfalls surrounding the Ferebee Glacier, or the spectacular “river of ice” known as the Meade Glacier, may be among the wonders you’ll encounter. Upon arrival at your glacial destination you’ll have the rare opportunity to explore one of Mother Nature’s greatest marvels. Enjoy a walking exploration of the river of ice, while experienced glacier guides answer your questions and explain the awesome forces at work. Enjoy VIP treatment on this exclusive historical driving tour of the most scenic spots that Skagway and Dyea have to offer. Your knowledgeable guide will take you through the bustling streets of Skagway in a deluxe passenger van. Then sit back and enjoy the breathtaking coastline drive to the most northern point of the inside Passage – the once bustling town of Dyea, now a protected area of the Klondike Gold Rush National Park. Here you’ll see the majestic scenery and wildlife of the tidal flats and the start of the famous Chilkoot Trail that led so many men to early graves. Stroll through the Slide Cemetery, quietly commemorating the scores of men and women who perished in the deadly avalanche in the spring of 1898. Walk the old main street of Dyea, once a town to rival Skagway, now almost entirely reclaimed by nature. On your way back to Skagway you’ll stop at the Skagway overlook for a bird’s eye view of the Skagway valley and an excellent photo opportunity of your ship in port. Your tour finishes with an outdoor picnic and a cold beer along the banks of the rushing Skagway River. Avoid the masses and enjoy the high quality and benefits of small group touring! A park ranger comes on board during our day slowing cruising around Glacier Bay National Park. They explain where we are and what we’re seeing as we get up close to some beautiful glaciers. Afterwards, the ranger gives a presentation in the theatre. It was a highlight from the last time I was on the Pearl. Description: Visit the Alaska Rainforest Sanctuary for this unique opportunity to see black bear in their native habitat. Your tour begins with a narrated city tour and eight mile coastal drive to the sanctuary. Your naturalist guide will bring the forest to life as you meander along a trail, leading to a series of elevated bridges and platforms. Watch for bears from the safety of above ground platforms which maximize your viewing and provide protection. To limit impact, only a limited number of small groups have access to this exclusive bear viewing area. Leaving the private elevated wildlife viewing system, the rainforest trail transforms to a boardwalk perched over grassy wetlands alongside Eagle Creek, where bears and seals come to fish for Alaska’s abundant salmon. Bald eagles and other birds wait for scraps in the estuary. See a Bald Eagle and a Great Northern Owl up close in the raptor center, where a wildlife specialist explains the habitat and heritage of America’s national symbol. Be guided through the historic Herring Bay Lumber Company Sawmill to a master Native carving a large totem pole. Your tour ends with a visit to the general store for shopping and snacks. This is a great tour for photographers and nature lovers, alike. TBD – We will likely walk around exploring the Inner Harbour. As we’re there during the evening, there are not many excursions to choose from. On this cruise, we’re staying in an inside stateroom since Jennifer tends to be a bit green at times. You never spend a ton of time in the room anyway so this way we can save money and spend it on excursions instead! This is the first cruise that I’ve booked with a TA, instead of directly with NCL. Now that I’m in Canada it made more sense to pay in $CAD so I went through Expedia Cruise Ship Centers in Yaletown. As this will be my 6th cruise with Norwegian, so I’m gold status with the Latitudes program. There are some great perks of joining the Latitudes program, including on-board credit, Latitude’s party with ship officers, welcome aboard gift, priority boarding etc. Quick tip: Cruise Critic is a great website to find reviews and/or ask questions of fellow cruisers – http://www.cruisecritic.com. If you’re interested in meeting up with new people on the cruise, you can join the roll call for your cruise and generally a meet & greet is scheduled with some of the ship’s officers. Check back after our trip for reviews of the cruise, ports, tours and more, plus lots of photos!